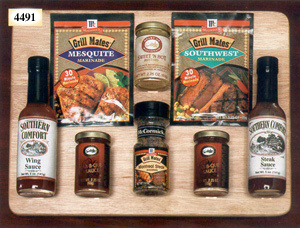 Make it a hit at your next BBQ with this handsome cutting board containing sauces, marinades, seasonings, and tasty gourmet mustard. Laser engrave the board for an even longer lasting impression. Shipping weight: 5 lbs. Measures 14” x 10” x 2”. Engraving area: 5” x 2”. Case pack: 6. Prices shown per piece. This board is the perfect size for entertaining. Shipping weight: 14” x 10” x 1/2”. Case pack: 24. Order in complete case packs. Individual mailers not available. Engraving area: 5” x 2”. 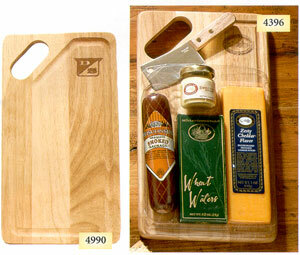 Command attention and gain respect when you give this impressive board gift. The channeled board contains Zesty Cheddar Cheese, Mesquite Sausage, mustard, and crackers. The cleaver is included. Shipping weight: 3 lbs. Measures 12” x 6 5/8” x 2”. Case pack: 6. Prices shown per piece. Engraving area: 2 1/2” x 2”. Engrave your logo on this attractive channeled board. A great give-a-way piece! Mailers are not included. Order in complete case packs. Shipping weight: 26 lbs./case. Measures 12” x 6 5/8” x 1/2”. Case pack: 24. Prices shown per piece. Engraving area: 2 1/2” x 2”. 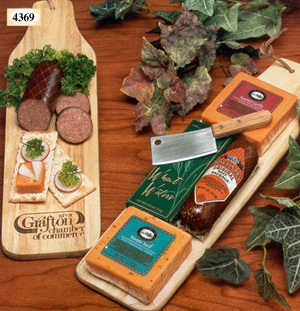 Tomato Basil and Roasted Garlic cheeses, crackers, and Beef sausage come on a paddle board. Cleaver is included. Shipping weight: 3 lbs. Measures 15” x 5” x 2”, including food. Case pack: 12. Prices shown per piece. Engraving area: 3” x 1 1/2”.